Amir Khan and Saul 'Canelo' Alvarez will step into the squared circle this Sunday for what could be a career-defining fight for the former. 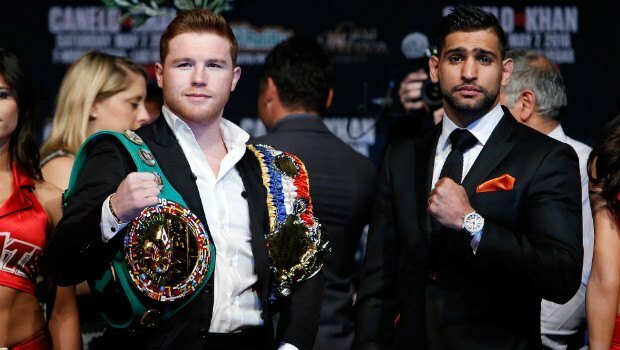 Despite holding onto more than a hint of resentment after missing out on a super fight with now-retired Floyd Mayweather, Khan is confident that a win over the man they call Canelo can take his career to the next level. The two boxers will walk into the T-Mobile Arena, Las Vegas, on Saturday night (the early hours of Sunday morning in the UK) and trade blows for the WBC middleweight title. Taking place at a 155 pound catchweight, Khan will make the walk as both the pundits' and bookmakers' underdog. With just days before the title bout, Ladbrokes Sports has Khan marked at 3/1, while other prominent bookies share a forecast closer to 11/4. 25-year-old Alvarez has only lost once in his 48-fight career and, of the bouts he's won, 32 have come by way of a knockout. The man many refer to as the best pound-for-pound boxer in the world will naturally be a physically imposing figure when the bell sounds and this is likely to be his biggest advantage. Canelo should be able to bully the smaller Khan in the early rounds and work the body effectively as Khan will likely have his hands held high in a bid to protect his chin. Of course, it won't be one-way traffic on Sunday morning and Khan has a number of ways to win the fight. Amir has already stated in a press conference that he's more than ready for the "monster" that is Canelo thanks, at least in part, to his trainer Virgil Hunter. Indeed, much of Khan's pre-fight camp has focused on balance and his ability to absorb the power shots from Canelo. While he won't be able to take too much punishment, Khan certainly has the speed advantage and, if he can use his jab while avoiding the big shots, he could win on points. If Khan can blind Canelo with speed and eke out a decision on points, you'll be able to enjoy a 4/1 return on your money at Ladbrokes Sports. Similarly, Paddy Power Sports is offering 3/1 on Khan winning on points while William Hill Sports will give you 10/3 on a victory via decision/technical decision. Essentially, this fight will come down to power and size versus speed and agility. If Khan can avoid an early barrage from Canelo, there's a chance he could outbox the bigger man. However, if Khan can't protect his body and gasses early, he's already shown his chin isn't his best asset (he was knocked out by Breidis Prescott and Danny García). Although unlikely, a draw is also possible. If Canelo comes out all guns blazing and wins the first six rounds, he could shoot his load too early and allow Khan to steal the final six. While the chances of this are slim, the adventurous among you can get some generous odds from Ladbrokes Sports (25/1) - as well as Paddy Power Sports (22/1) and William Hill Sports (22/1) - if you hedge your bets on a draw. Regardless of the pundits' predictions, Khan vs Alvarez looks set to be another fantastic night of boxing. If you want to add some more spice to the event, make sure you check out the latest odds with Ladbrokes Sports!